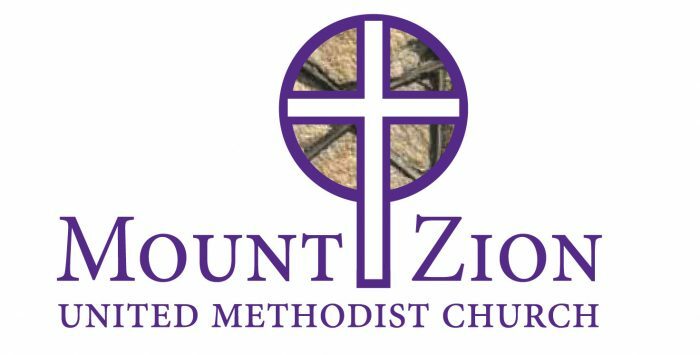 The beautiful stained glass windows in our sanctuary are the most striking architectural feature of Mount Zion United Methodist Church. The windows are original to the 1924 structure and among the most beautiful in the upstate with classes from Clemson University coming to study them. During the 1950’s, the windows were memorialized; and the money was used to restore the sanctuary and purchase a cross and brass candlesticks for the communion table. Whether sunlight is streaming brightly through them, or the colors are muted by a cloudy day, these windows are a treasure from times past and will give joy long into the future. The largest of the stained glass windows is the one which takes up most of the wall that faces Church Street. Situated between the double wooden doors, the window may be appreciated best from inside the sanctuary looking back towards the doors. This window carries the Gassaway family name. 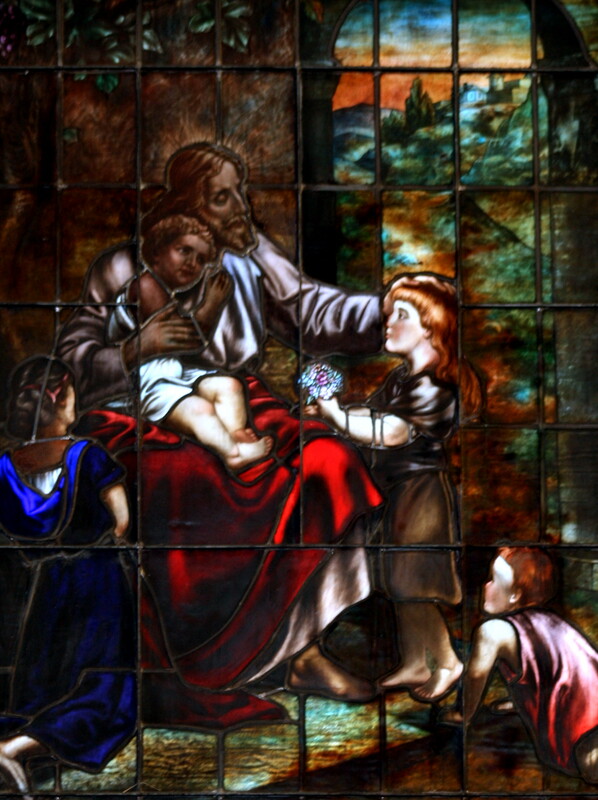 “Suffer Little Children To Come Unto Me”. This windows memorializes James D. Gassaway and Mariah H. Gassaway. The crest at the top of the window gives the installation year of 1921. Walter L. Gassaway, who grew up in Central and cherished the church of his parents, made the original $50,000 donation toward construction of the church in 1923. That amount in 2018 dollars would be ~$720,830.41. 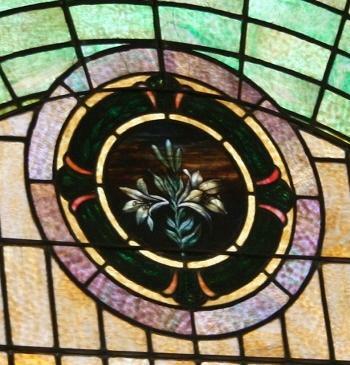 This window memoralizes Walter’s parents, James D. Gassaway and Mariah Douthitt Gassaway. More information may be learned about the Gassaway family at Clemson Wiki. The chalice symbolizes the cup of the Last Supper where Jesus offered his blood for all of us. This window also memorializes the Gassaway family. The sheave of wheat represents the gifts of God, the fullness and the bounty of the Lord. “Hither By Thy Help We’ve Come”. 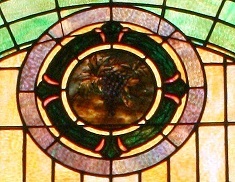 The grapes symbolize the unity of the church. that ran through Central and his wife, Elizabeth G. Ramseur (1860-1945). 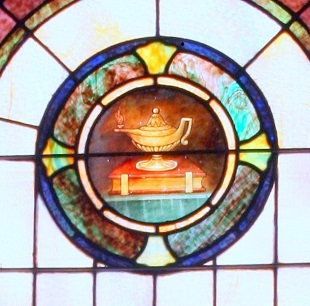 The lamp symbolizes Christian knowledge. This window memorializes the F. Burt Morgan family. Jeptha Morgan was a Central merchant whose daughters Jessie and Jennie were active in many ways during their lifetime at Mount Zion. Their home is now the Central History Museum which is located two houses down from the church. It is open to the public on Sunday afternoon. The anemone is symbolic of the Trinity. It is sometimes depicted in scenes of the Crucifixion as it was said that the flowers sprang up on Calvary. The Easter Lily is symbolic of the resurrection although there is no specific scriptural reference to it. 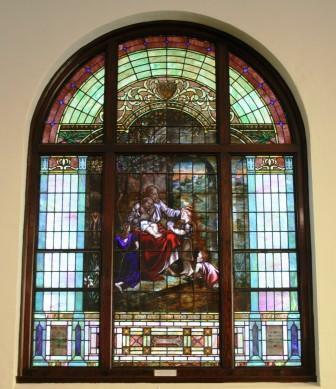 This window memorializes William Wallace and Bert H. Wallace and is dedicated “To The Glory of God” by the Wallace family. William W. Wallace came to Central in 1912 as Superintendent of Central’s High School. Later he became president of Cannon Mills. The Bible is symbolic of God’s Holy Word, the main road map for the Christian. 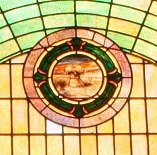 This window memorializes the Gaines Family: Sallie Gaines, R. G. Gaines, and W. A. and Eloise H. Gaines. Several pioneer members of this family had a great part in organizing the early Mt. 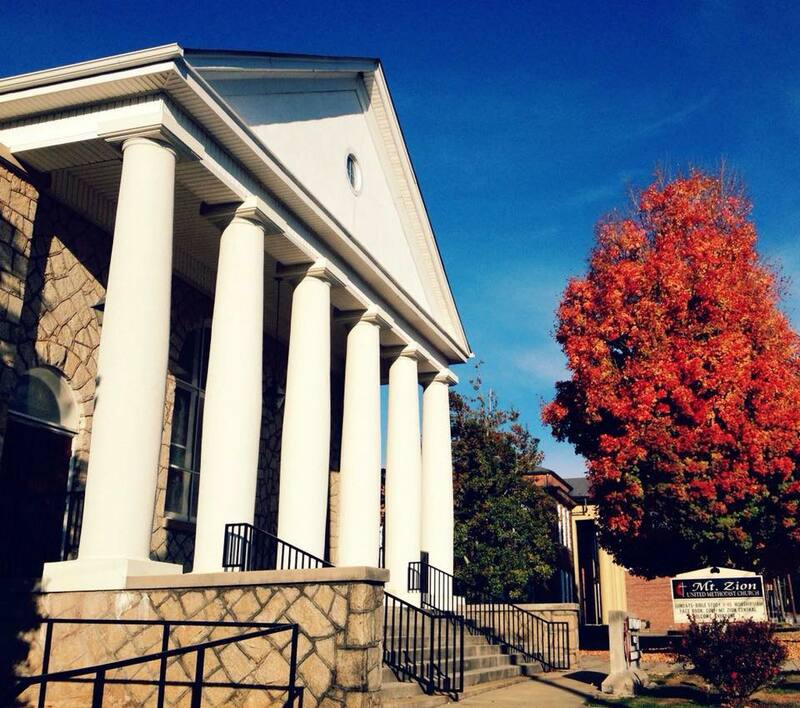 Zion church and descendants remain active to this day. 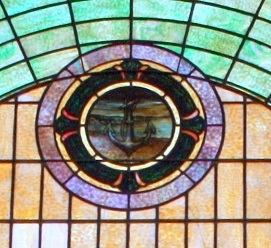 The Anchor is symbolic of Christian Hope – the Hope of salvation through the cross of Christ. 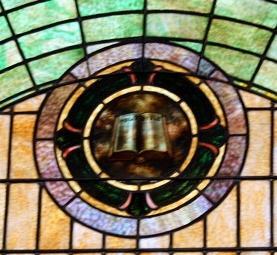 This window memorializes John N. Sims (1879-1945). 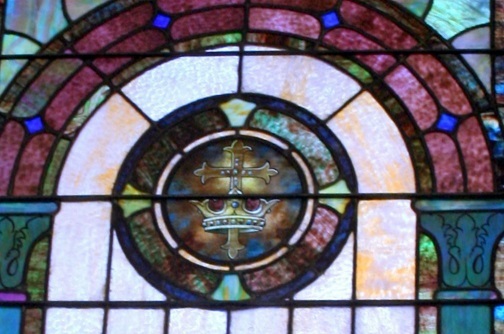 The Cross within the Crown is a combination of two Christian symbols. The Cross reminds us of Christian death and the Crown symbolizes the reward of the faithful in life after death. This window memorializes Ben and Ada Abercrombie. Mr. Ben F. Abercrombie served as Sunday School superintendent for 28 years. This window memorializes Faye Dobson, the 11-year-old daughter of Mollie Newston Dobson (1913-2007). Faye was born in 1937 and passed away in 1949. 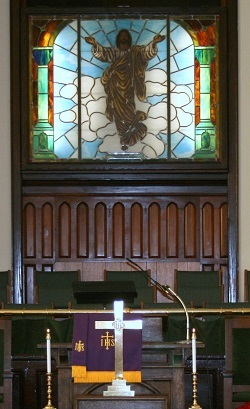 This stained glass image is back lit and was given by Harold Wood in memory of his wife, Martha B. Wood. It was added in 1999 after the organ and pipes were removed from the chancel area.